No credit card required. Get started in seconds! Workforce.FM is field service and job management software designed for all manner of businesses employing field staff. Our software is designed to make your job simple, and includes a stock management feature that keeps inventory information where you need it at all times. For a field service management application to work seamlessly and truly boost productivity it needs to take the company’s entire operations into account. You can’t deliver the services your customers pay for if you haven’t got the equipment and materials to do so, and juggling job management with inventory on separate systems is a lot of hassle. 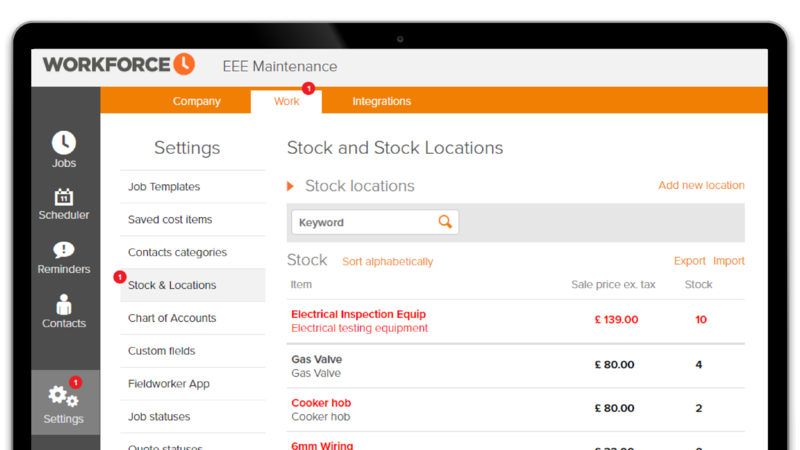 Workforce have worked hard to make it easier than ever to integrate stock management into our industry leading cloud based mobile software for the field service industries, with automated processes and an alert system to keep you on top of things. Stock management isn’t a standalone part of your business operations as a field service company, but an integral part of what leads to your success. That’s why Workforce have incorporated stock inventories into job creation, tracking and completion. Add the relevant items to a job when it is created, then when it is marked complete, stock levels will be depleted on the system, so you are always updating your inventory without even thinking about it. Define a stock level at which you would like to receive a notification from Workforce reminding you to replenish a depleted item. Workforce is designed to be intuitive and straightforward, whether the user is a field worker, senior manager or administrator. 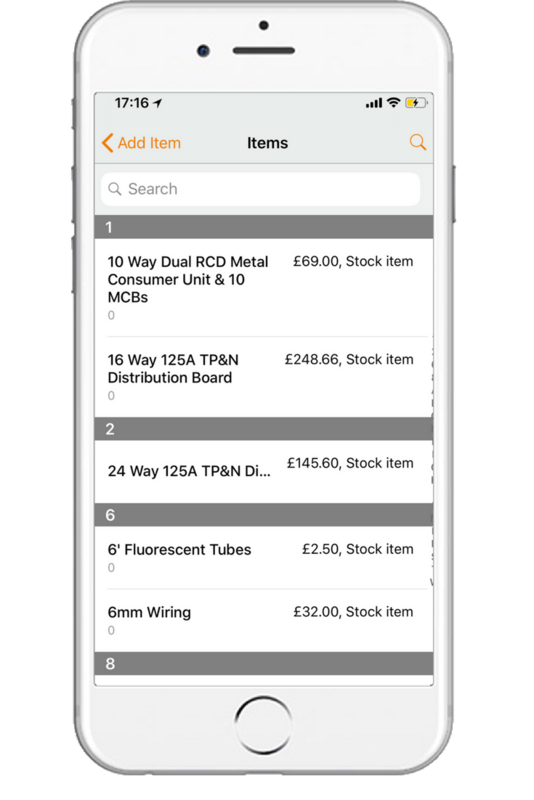 The stock management feature of the app is simple, hassle-free and offers plenty of options for automation. You can also set up different locations for your stock as needed for a more organised and effective system. This could be for the number of vans in your fleet, storage facilities you may have access to or customer sites. Like many of Workforce’s features, the data in your stock management tool can also be imported and exported as a CSV file for reporting purposes as needed. We believe that our stock management tool sets us apart from the competition in the field service management app market, but we don’t expect you to take our word for it. Try the app for yourself as part of our free 14-day trial to experience the enormous benefits of a fully integrated field service management system. This is a no obligation, no auto-subscription trial. We simply provide you with full access to Workforce’s amazing features for the duration of the trial period, after which you can either subscribe or let your account close automatically. No commitment and no auto-subscriptions, just free access and an opportunity to prove why Workforce is the leading field service management app on the market today. "Workforce has really helped us manage the communication between our office staff and field workers. Its easy to get started and perfect for Engineers, they just get how to use it without any training. 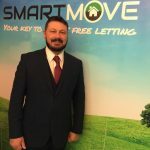 I'd definitely recommend Workforce if you have a mobile based team"
"I really like that all of our field technicians have full access to all of the information they need instantly. It has enabled us to achieve operational efficiency both in office and out in the field"
"The software itself is very easy to use for small businesses like ours. It has been the simplest to use without compromising on quality. One of our engineers despises technology and I know he will be fine with this! " Create and send professional quotes to customer and convert more business. Create a job or create a recurrence of jobs in seconds saving valuable admin time. Instantly schedule jobs to the right person using the drag and drop scheduler. Generate invoices and batch multi job invoices in seconds using data from jobs. Fieldworker mobile Apps for both iOS and Android that work both online and offline. Create your own job statuses and work with Fieldworkers to update jobs instantly. Track and view the location of your Fieldworkers in real time on a map. Fill in commercial and domestic forms (such as compliance) directly from the Field App. Have your customers, suppliers and contractors in one organised system. Manage customers with multiple properties using our Sites features. Manage stock items, as well as saved costs such as services. Integrate workforce with your accounting software and payment processing. © 2017 WORKFORCE. ALL RIGHTS RESERVED. 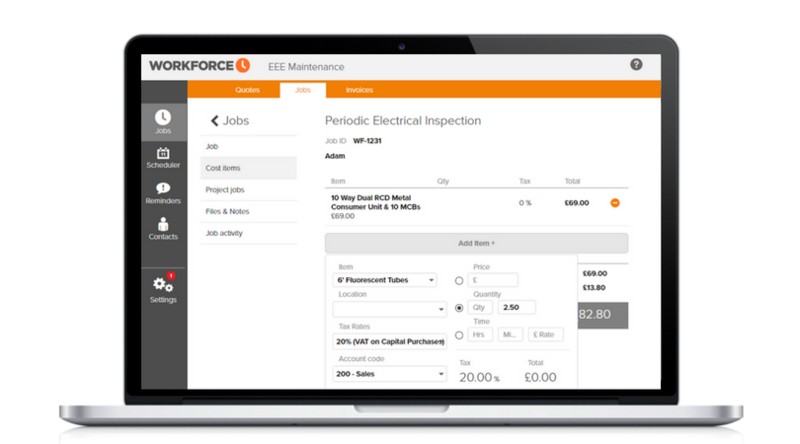 Workforce.FM makes life easier for service businesses by simplifying and streamlining job management and field service operations. Our real time platform lets you schedule, allocate, track, quote and invoice jobs seamlessly. Instant photo and signature capture means your fieldworkers can do their work without worrying about paperwork. All details are synced and organised instantly across the Workforce.FM platform, keeping field workers and office-based staff up-to-date at all times. Would you like a free trail of Workforce? Start with a 14 day trial! Start now with a 14 day free trial! Start today with a 14 day free trial! Give us 14 days and we will help organise your back office, eliminate paperwork and make it easier for your fieldworkers to receive jobs and complete work out in the field. No credit card or commitment required, it’s totally risk free.